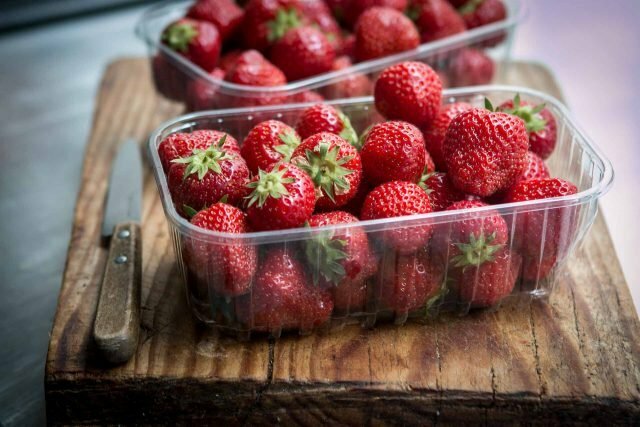 During spring and summer in Paris, there’s an overwhelming amount of strawberries at the outdoor markets. 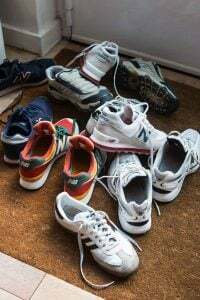 The sweet, fruity scent pervades the air as you get closer to the stands and I always walk around and take a look at what people have, to find the most fragrant and deeply color baskets. For me, it’s impossible to come home with just one basket. And when the season hits in full force, I gladly buy more, and churn them into strawberry frozen yogurt. 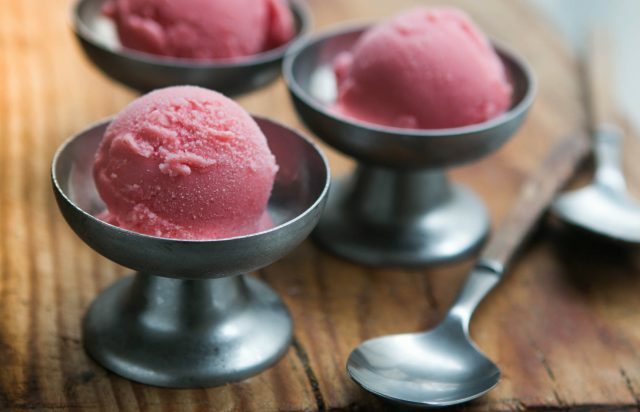 It’s very easy to make and unlike strawberry ice cream, you don’t need to do any cooking. It can easy be made in a blender or food processor and takes just minutes. 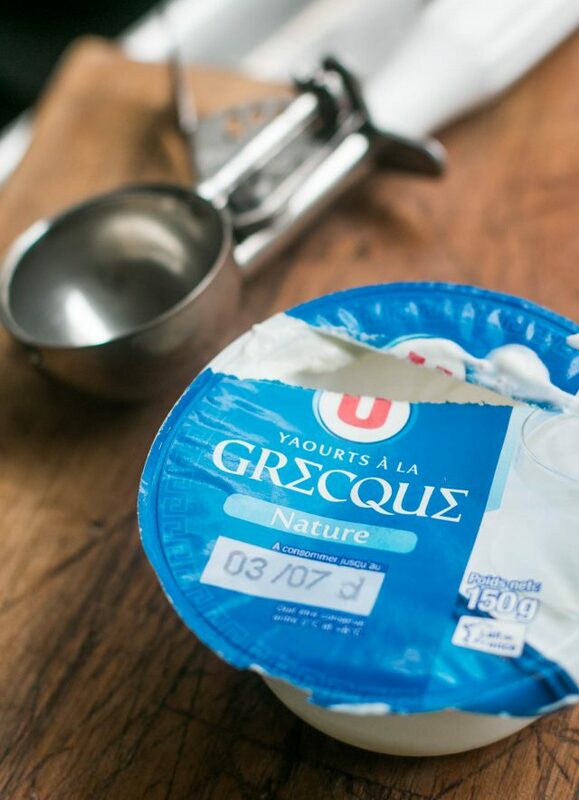 I tend to favor Greek-style yogurt, which has become more popular in the last few years, and is even available at my local supermarket. It’s richer and thicker than regular whole-milk yogurt, and has less water, so it’s an ideal base for frozen yogurt. The yogurt also adds a nice tang as well to the frozen strawberry yogurt, which nicely offsets the sweet berries. Slicing the strawberries and marinating them in sugar makes the berries extra-bright red in color and can make even ho-hum berries delicious. Use a Greek-style yogurt for best results. Regular whole-milk plain yogurt can also be used. 1. Hull and slice the strawberries. Toss them a bowl with the sugar and vodka or kirsch (if using) until the sugar begins to dissolve. Let stand at room temperature for 2 hours, stirring every so often. 2. 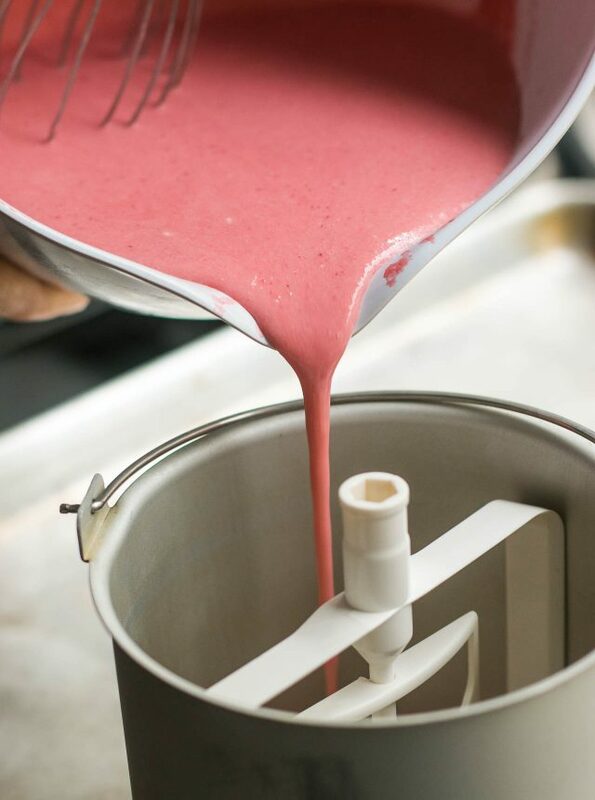 Transfer the strawberries and their juice to a blender or food processor. Add the yogurt. Pulse the machine until the mixture is smooth. If you wish, press mixture through a mesh strainer to remove any seeds. Taste, and add lemon juice if desired. 3. Chill for at least 1 hour, or overnight, then freeze in your ice cream maker according to the manufacturer’s instructions. Ah the life of markets. Miss it all! sigh. sigh. sigh. i can practically smell your strawberries. i was gonna be all super jealous and stuff, but then i remembered that i live in california now. i should be able to gain access to some of this stuff, right? sans chariots? It may be a teensy bit cruel, but I can’t wait to tell my fourth graders that kids in France go to school six days a week. They will be shocked. I feel sorry for their teachers, unless they get paid a LOT more than I do. Your tomatoes look like Ugly Ripe Tomatoes. There is a big controversy surrounding them here in Florida. What gorgeous pictures. My mouth is watering. I didn’t realize you were in Texas recently. I took one of your classes before you moved to Paris and I’ve been on your list and I’m so glad you now have a blog. I hope to sign up for one of your tours next year. Loquat season in my country nearly ends, my parents have a tree in their yard and we use the fruit for making jam, sorbet or in cakes; to all we add cinnamon. I don’t complain. David, you’re the expert with the imaginative thinking. David, it didn’t mention in the recipe– how much kirsch/vodka do you add to the macerating strawberries? P.S. And those tomatoes? Oh, my God. Do they smell as good as they look? Oops. I added the kirsch and/or wodka amount. Sorry. My modem started smoking and burnt out this weekend due to ‘currency fluctuations’ and was trying to blog leading out over the roof, capturing a neighbors signal. I’ll get some loquats and give them another chance this week. As I said, I think they’re lovely, but I guess when I bite into them, I’m expecting something else, perhaps apricots, since they resemble them. And those tomatoes didn’t have much of a fragrance, but they sure looked pretty! Loquats? Strawberries? Tomatoes? I am falling off my chair with envy right now. Wow great strawberries (and SO cheap) and sending your kids to school 6 days a week!! I’d be in heaven. But a BIG question – What did you do with your rhubarb? My reign for these tomatoes! Slurp! Add some extra virgin olive oil and some salt… Superb! Thank you for this walk, David! Wow, what a great post! I have a loquat tree in my backyard and have tried baking with them before but it never turns out quite right. I have found that the best solution is to just eat them as a healthy snack as well! Noticed that your photo file called the tomatoes “savoie” — is that the variety, per chance? They look as if they are an heirloom variety. It is great to see a lot of good nurseries in the U.S. now offer all different kinds of heirloom tomatoes for Spring planting. Mr. Stripey, Brandywine, Black Prince, etc., etc. Time to get planting …..
Loquats are called biwa in Japanese. 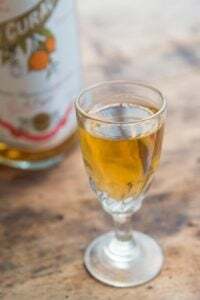 You can find loquat jellies and teas here in Japan, or you could make tarts! That tomato picture is a gem. I am really stunned by that. It makes me weep with envy! I love your site. fabulous! David– Can you please tell me just what brand of French yogurt you find to be “astoundingly good”? I have lived here for nearly 20 years (in fact we are in the same neighborhood and obviously shop at the same market) but I find yogurt here to be appalling mostly because of Danone’s grip on the market. And don’t even get me started on the dearth of organic yogurt. Going back to NY every summer one of the first things I indulge in is Brown Cow –with every ounce of cream on top! I have tried yogurt from every source: market, Monoprix, health food stores etc but in deference to your professional taste buds I have obviously missed one source. Please share!! BTW, I also stopped to gape at those tomatoes on Sunday. They are called “coeur de boeuf” or beef heart. I think they are the same as the beefsteak tomatoes in the US, but a touch sweeter. I agree with your nÃ¨fle assessment. I’ll be watching this space for good ideas from the other readers! David- Could you please tell me what brand of French yogurt you find to be “astonishingly good?” I have lived here for nearly 20 years (in fact we are obviously neighbors and shop at the same market on Sundays) and I find French yogurt to be appalling mostly because of Danone’s stranglehold on the French market. And don’t get me started on the dearth of organic yogurt! 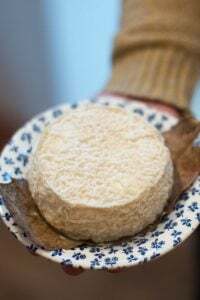 Going back to the US every summer one of the first things I indulge in is Brown Cow…with every drop of “cream on top.” I have tried every source in Paris: Monoprix, outdoor market, health food stores; but I have obviously missed one. Please share! I also stopped to gape at those tomatoes on Sunday. They are called “coeur de boeuf” and I believe they are the same as the beefsteak tomatoes in the US, albeit a touch sweeter. I agree with your nefle assessment. I’ll be watching this space to see if your readers weigh in with some good ideas. I lived right near where Brown Cow started and used to like it, but now I find it’s too gunky (and it gave me a muffin-top) and in SF would buy Strauss yogurt. A friend with 2 children in Normandy told me about the hours/days her kids go to public school (half-day on wednesday + saturday.) Perhaps the kids in Paris get a break, or yours are just telling you there’s no school those days…to play hookey! Tania: It’s hard to replicate the ‘scoop-ability’ of store-bought ice cream. Home machines don’t whip much air into ice cream so it’s bound to be denser and harder to scoop. Some people do use gelatin to improve the texture, but I never do. Alcohol, fat, and sugar keep homemade ice cream softer so that’s why I add a bit of alcohol (and for flavor.) In general, you can add up to 1 tablespoon of alcohol per cup of ice cream or sorbet mixture. 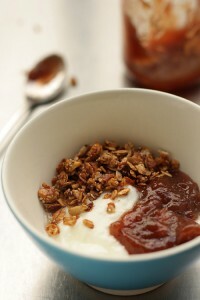 You can also use high-fat Greek-style yogurt as well or drain whole-milk yogurt yourself. I wish I had some of those fruits and veggies in my store. I can’t get over the tomatoes! Thanks for sharing! Ooh, those strawberries. All the shots of the produce are just spectacular, David. And who is that sassy man making a face behind that stall? Hm. I’m jealous of hell of your fresh produce. Luckily, the farmers’ markets open here this week! 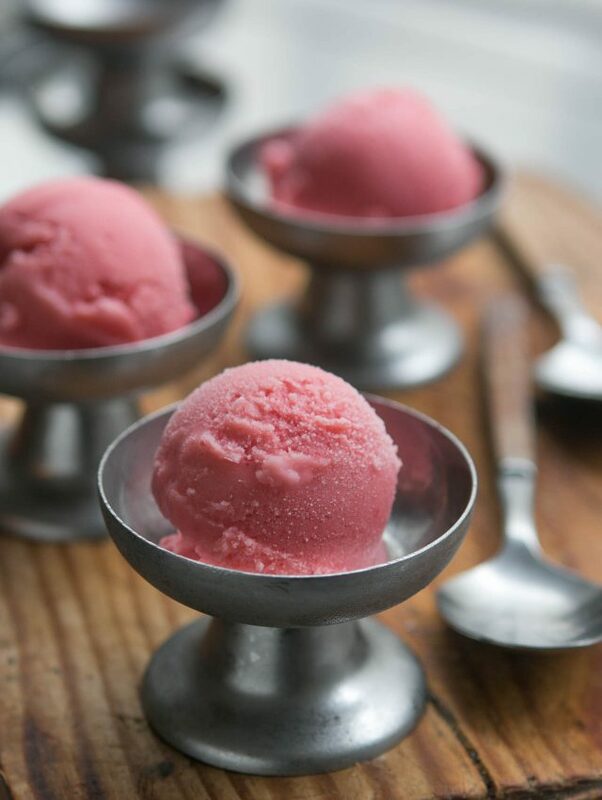 I have to make this strawberry frozen yogurt this weekend. You totally should have bought a sponge. David- Thanks for the yogurt tip. I haven’t tried that circuit in years. I also look for the live cultures (bifidus et al) which doesn’t seem to be a big deal here. For a blip of time you could get an awesome Irish yogurt with all 4 (?) of the main live yogurt cultures at Monoprix but those days are long gone, alas. I can’t even begin to fathom what “muffin head” is but I know lots of people don’t care for Brown Cow. I have heard great things about Strauss but I rarely make it to the West coast. Perhaps I’ll be able to find it in NY? Re: the frozen yogurt recipe (or any ice cream recipe) is there any way to make it without an ice cream maker? Thanks so much for the Strawberry Frozen Yogurt recipe. My wife made it yesterday (with vodka, no straining) with $1/pound surprisingly fresh, imported-from-Mexico, non-organic strawberries and Greek-style whole milk yogurt from Trader Joe’s. It came out TERRIFIC — better than any strawberry ice cream or gelato we’ve ever made. It’s soft and it really tastes just like the berries. 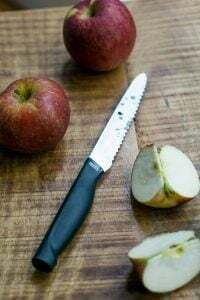 – Would this work with other fruit? We’ve been looking to make a mango ice cream. – Could you use a sour cream instead of yogurt? Again, thanks for the great recipe — keep up the great blogging! When I was growing up in the ’60s here in Australia, many of the older suburbs had loquat trees and nobody ever did much with them. They do make a lovely jelly,quite fragrant and delicate. Thanks for all your tips about the jam. I keep circling the loquats, thinking of buying some, but in the end come home sans loquats. Must be a guy-thing. JPS: I don’t know about substituting other fruits. If you use the exact same amount of fruit puree it should work. Sour cream works very well in this recipe too. Haappi: Maybe one of my readers will leave a comment here describing what a ‘muffin top’ is. It’s very American to give ‘that’ a term like that…and really funny, I think. Unless, of course, you’re the one with the muffin top. Then (speaking for personal experience) it ain’t all that funny. David – as to the loquats. Go without. They aren’t going to taste any better this time. We have three loquat trees in our yard and they are fan-tastic. However, every single loquat I’ve bought was much less flavorful – and this in a country where they are not imported, or transported far distances, etc. So, if you find yourself confronted with a loquat tree (the season just ended, sorry) – that’s when you want to try a loquat. Or a whole handful, because they are addictive! 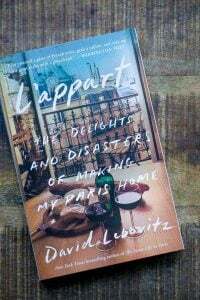 (and I love this blog – it is reminding me of all the wonderful things I enjoyed about Paris, as well as some of the not-so-wonderful) :-) I lived not far from where you are – I lived near the Bastille area, too. Dear David, I just want to thank you for this wonderful frozen yoghurt recipe, it’s absolutely fantastic! I’ve blogged about it today and translated your recipe into Hungarian if you don’t mind. Thanks again! I was at your local Bastille market this very Sunday morning (have just got back to Edinburgh few hours ago:), and saw these nÃ¨fles as well. Totally new to me – until I read your post, that is! The market itself was busy and wonderful, too bad I could only squeeze some wild asparagus, fresh bay leaves and aromatic light green oblong peppers into my bag..
Cover with plastic wrap and let stand at room temperature for 2 hours, stirring every so often. I’ve got a batch of this yummy looking strawberry frozen yogurt prepping right now. But I have a question for you. Why specify that it needs to be covered with plastic wrap? Why not a pan lid, a casserole cover, a cookie sheet, a kitchen towel, etc.? Why a piece of plastic wrap to be used for 2 hours then thrown away? I admit, this has become a pet peeve of mine. In the grand scheme of things, what’s a few pieces of plastic wrap? But the usage is often so unnecessary. Wrapping a cut onion in plastic wrap, sure, I’ll do that. But covering a bowl? I’ve got plenty of alternatives. Not to mention that a durable cover is easier remove and replace in a case like this where one wants to stir the mixture a few times throughout the process. Hi Karen: I don’t actually use that much plastic wrap, but in certain instances, like when you need to store something in the fridge, using a cookie sheet on top isn’t practical. I sincerely believe that people can decide to use something else to cover a container, and they don’t need to follow that instruction precisely to the letter. I just wanted to report that I had great success substituting yellow peaches for the strawberries in this recipe. 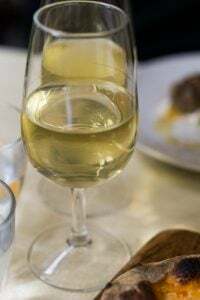 I tweaked the alcohol element a bit by using 3 TBSP Vin Santo in place of the distilled spirits and used around 2 TBSP lemon juice to compensate for the sweetness of the wine. Hi David! Got the perfect scoop a few days ago, and I love it!!!! But I miss one recipe, and I thought I would find it here on your website… I live very close to an italian gelateria that makes an awesome lemon frozen yogurt. Maybe you have a recipe for that? I would be very grateful. Olle: Glad you like the book! Because there’s a slew of other lemon frozen desserts, there wasn’t room for a Lemon Frozen Yogurt. 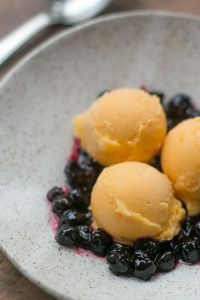 But you can use the recipe for Vanilla Frozen Yogurt (page 49) and add a few tablespoons of fresh lemon juice and some zest, to taste, and create your own. Happy churning! 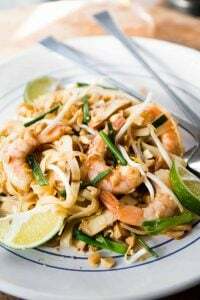 yummy o,..gonna prepare this soon, and let you know,. I have made this recipe twice and when I do its never the deep red color that I see in your picture. I wonder if the strawberries are juicier in France or if in fact you used more than a pound. Either way, its delicious. Hi Carolyn: Some strawberries may be red on the outside but are white within (most commercial berries) which will, of course, affect the color of the frozen yogurt. For best results use top-notch berries and don’t overlook the step of letting them rest with the sugar for a couple of hours; that really augments the color immensely. I love your ice cream recipe book and my husband is addicted to your strawberry frozen yogurt. I’m in the process of trying to create a pomegranate/strawberry frozen yogurt combination. I was wondering if you had any suggestions. I’ve tried adding 1/4 cup of pomegranate juice (flavor wasn’t strong enough). I also tried removing 1/2 cup of the strawberry puree and add in 1/2 cup of pomegranate juice and it changed the consistency. Any assistance would be appreciated. 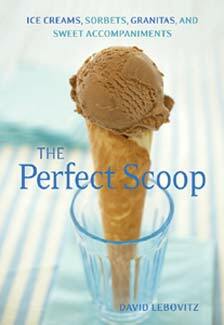 I just brought your perfect scoop and its the best book ive brought in a long time, im having a ball with it. While reading i came up with a new challenge, Kombucha ice cream/sobet! id love to see you take that on when you have the time if you do, please tell me how it went or blog it and i’ll make it myself. Made this today. I was a little short on strawberries, so I added a ripe peach as well. Excellent results! I’ve been enjoying your blog for quite some time but have never posted. A few weeks ago, I was looking for something to do with my 11 pounds of u-pick strawberries, and I found this recipe. Not having time to make it immediately, I mixed the strawberries and the sugar, and threw it into a ziplock bag. Tonight after work, I needed a sweet pick-me-up, and threw this together. It was fantastic! Thank you for this most excellent recipe. Even my boyfriend who says he doesn’t like frozen yogurt licked his bowl! Also, I tried your salade de carottes rapees earlier this week with similar excellent results. We just bought the ICE-30BC 2 Qt frozen Yogurt Sorbet & Ice Cream Maker: I tried a yogurt recipe in the booklet which we churned for 55 mins and still it remained a thick liquid. (The bowl was properly frozen). I will try your recipe very soon but can I have a confirmation that the booklet recipe is not so good rather than the new machine being defective? (3/4 cup whole milk, 1/3 cup sugar, 4 cups lowfat yogurt, 18 ounces puréed berries, vanilla). The mixture did seem to come almost to the top of the bowl. I read suggestions related to these types of ice cream makers- that a towel placed over the top would keep everything cooler-is this necessary? About your recipe; do the strawberries and sugar have to stand for 2 hours if omitting the vodka? I hope that the yogurt mixture can get the same thickness (after churning) as in the photo! thanks in advance & looking forward to making this yummi treat! Hi Lara: I can’t comment on recipes from other sources, but the one I give here in the post works quite well. You can call Cuisinart to inquire about their recipe and their machine. The marinating of the strawberries isn’t necessary but I do it to augment the red color of the berries and make sure they get infused with the sugar. The liquor helps keep the frozen yogurt softer, once frozen, but as mention, that’s optional. Hi David! Attempting other recipes before this one, but it will be tried soon…cause we got fresh strawberries! Just letting you know that we tried a recipe for a quart of vanilla ice cream; it had wipping cream and milk -this time it was successful! We put a towel over the top of the ice cream maker just in case. So we will stick with smaller recipes regardless of what the manual says and treat the 2 quart maker like a 1.5 quart. I even called customer support and was told the recipes should work as is, but hey, nothing beats personal experience! We are homemade ice cream converts forever! What a fantastic recipe! The macerating step totally makes it, as does the alcohol. So easy, and such pure strawberry flavor. Thank you so much! I want to adapt the recipe for use with peaches, which are currently good, local (here in Pittsburgh), and cheap. Any suggestions? I have some homemade peach liqueur to use as the alcohol, so I’ll reduce the sugar accordingly. In your experience, do peaches need as much sugar as strawberries? I know that it depends on the particular fruit, but I was wondering if you had a rule of thumb. Strawberries hit the farmer’s markets today (early for Maine!) so I made this, with a couple changes. I used a little extra yogurt and added a few sticks of rhubarb that I cooked down with a little water and a handful of sugar first. Then when the frozen yogurt was almost done churning I added some chopped up dark chocolate with sea salt (http://www.lindtusa.com/product-exec/product_id/353/category_id/5/nm/A_Touch_of_Sea_Salt_Bar). I also didn’t feel like dragging out the food processor (so many PIECES to wash) so I just used a potato masher – it turned out fantastic! I love The Perfect Scoop, by the way. The recipes are accessible and still ambitious. And, obviously, they taste great. I really enjoyed this recipe, especially with the strawberries from my CSA share (sadly, too few berries for my tastes). I also love the idea of adding dark chocolate. Could there be a better combo than chocolate and strawberries? I think not. Thanks for the recipe! I know this is an old thread, but I just came across this recipe and it looked so good I had to try it. This is the BEST frozen yogurt I have ever tasted. I made some changes to reduce the calories, including adding some Splenda instead of 100% sugar and adding a little more lemon juice. I also used 7 oz of 2% fat Fage Greek yogurt and 6 oz of 0% fat Fage Greek yogurt to cut down on the fat content. Not sure if this mattered but let the strawberries, sugar, and vodka (citron flavored) sit for longer than 2 hours. Came out AMAZING! Creamier than any frozen yogurt and most ice creams I have ever had. Thanks for posting this! Just made this today with blueberries instead of strawberries. It was phenomenal and so creamy! I added just a smidge more sugar since blueberries are a bit more tart than strawberries, and it was perfect. I may try this with a non-fat greek yogurt next time to compare the flavors. In this heat, the lighter the better. 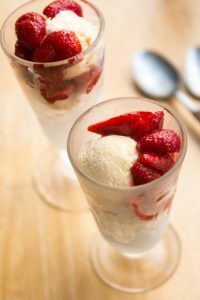 I’m desperate to find a recipe for yogurt or buttermilk parfait (since I do not have an icecream machine). Do you happen to have one?